Why has Old Possum’s Book of Practical Cats had to wait so long – almost 80 years – for a canine companion? There may be a number of reasons. T.S. Eliot himself, a cat lover writing for the cat-loving children of friends, had no equivalent fondness for dogs; he seems, in fact, to have rather scorned them, particularly if they happened to be Pekes; so, sadly, he was not the man for the job. But who else would dare follow such a class act as Practical Cats? Hooray for Christopher Reid, who took on the challenge. Fools rush in, as we’ve been told, and when Clare Reihill, who manages the Eliot Estate, rang me up to ask if I would consider creating a companion to Old Possum’s Book of Practical Cats, I said yes, on the spot. Unthinkingly, almost. Or at least, somewhere at the back of my mind, beyond logic and words, a flash of understanding as to how it might be done struck immediately. The whole tone and tenor of the book were so clear to me then that I wanted to start without delay. after which dogs of all breeds, characters, talents and attainments were let off their leashes and encouraged to behave with their idiosyncrasies and eccentricities on full display. Dobson the Dog Detective, who solves crimes without leaving his bed, and who is in many ways the opposite of Eliot’s criminal genius Macavity, was one of the earliest. Lola, a French Poodle who runs away to join the circus and, after mastering all the acts, ends up owning it, was another. 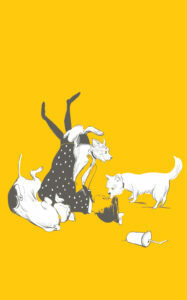 Step by step, then, or pounce by pounce, I explored the world of dogs, which I found to be as full of variety and marvels as the world of cats that Eliot introduces us to. Without doubt, it helped to have Eliot’s example always ahead of me. The place that Practical Cats occupies in Eliot’s oeuvre is an odd one, coming as it does after the asperities and austerities of such works as The Waste Land and The Hollow Men. Its exuberance and joy feel like a well-earned release. I have no track record worthy of setting beside his, but my Consequential Dogs may have served a similar function, offering the pretext for a rejuvenating frolic that I hope will amuse the reader, especially the young reader, as much as it did me throughout the few months I spent writing it. 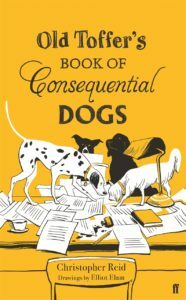 Old Toffer’s Books of Consequential Dogs is published by Faber, and a recommended read for National Poetry Day.